Political satire doesn’t get any more immediate than this entertaining novel. Morris Feldstein, hen-pecked husband and obedient pharmaceutical salesman, has one rule in life: Make No Waves. One fateful day he breaks his rule, setting in motion a farcical and dangerous series of events that connect him to seductive women, Muslim terrorists, and secret government agents. How did Morris get in this bizarre predicament? How can he convince the counter-terrorist squad - and, critically, his wife - that he really is just mild mannered Morris? Author Steve Israel is a real-life Congressman from Long Island who obviously relishes in the inanities and Catch-22-like actions of the government. Reading this novel is like reading the current news, only funnier! “Writing in the full-tilt style of Carl Hiaasen” (The Washington Post), this jaundiced political satire was ripped from the headlines and penned by an author who’s met the characters, heard the conversations, and seen the plot twists firsthand. Meet Morris Feldstein, a pharmaceutical salesman living and working in western Long Island who loves the Mets, loves his wife Rona, and loves things just the way they are. He doesn’t enjoy the news; he doesn’t like to argue. Rona may want to change the world; Morris wants the world to leave him alone. Morris does not make waves. But one day Morris is seduced by a lonely, lovesick receptionist at one of the offices along his sales route, and in a moment of weakness charges a non-business expense to his company credit card. No big deal. Easy mistake. But the government’s top-secret surveillance program, anchored by a giant, complex supercomputer known as NICK, thinks differently. NICK begins to thread together the connected strands of Morris’s life—his friends, family, his traffic violations, his daughter’s political leanings, his wife’s new patients, and even his failed romantic endeavors—and Morris becomes the government’s public enemy number one. In his “laugh-out-loud funny” (Chris Matthews) debut novel, author “Steve Israel reveals his inner Jon Stewart” (Daily News, New York). The Global War on Morris toes the line between recent breaking headlines and a future that is not that difficult to imagine: “Why read this when one can see Washington insiders acting like buffoons in farcical situation on CNN? This is funnier than Wolf Blitzer, that’s why” (Library Journal). "If there's a writer currently serving in the U.S. House of Representatives funnier than Steve Israel, I have not been made aware of their work. 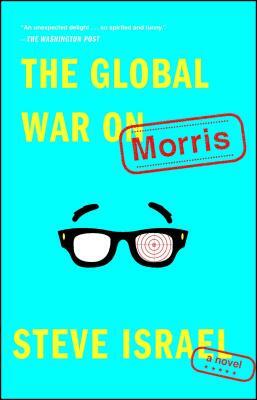 The Global War on Morris is a great, smart, and funny read." "This very funny political satire, set in 2004, reads like it could have sprung from the keyboard of Christopher Buckley.... As political satires go, it's really good; as debut novels go, it's even better." "I was laughing out loud." "[I]t’s an unexpected delight to find “The Global War on Morris,” a political satire by Rep. Steve Israel (D-N.Y.), so spirited and funny... writing in the full-tilt style of Carl Hiaasen, Israel... skewer[s] his way through one gaffe after another in the fight against domestic terrorism. Imagine 'It's a Mad, Mad, Mad, Mad World' with a soupcon of al-Qaeda."" "Rep. Steve Israel reveals his inner Jon Stewart in his debut novel....The book amounts to a critique of what Israel deems the overreaching of the Bush-Cheney efforts."